We at TGTF first covered Manchester garage rock band Spring King back in 2015, when they appeared at that year’s SXSW Music Festival. At that point, Spring King (comprising lead singer, songwriter and drummer Tarek Musa along with Peter Darlington on lead guitar, Andy Morton on rhythm guitar and James Green on bass) were working feverishly to make their name known. In my review of their performance at the 2015 Transgressive Records showcase, I commented on the band’s “strong sense of propulsive momentum and energy”, which has now materialised in the form of a full-length album titled ‘Tell Me If You Like To’. As far as energy and momentum are concerned, ‘Tell Me If You Like To’ delivers on Spring King’s early promise. The album is a massive wall of sound from beginning to end, rarely pausing to catch a breath, much less relax or rest on its own laurels. The album’s opening track is the insistent and rather clamorous early single ‘City’, which was drawn from the band’s 2015 EP ‘They’re Coming After You’ and which was chosen as the first song to be played on Zane Lowe’s Beats 1 radio on Apple Music in June 2015. Late album track ‘Demons’ is taken from Spring King’s 2014 EP of the same title, but the rest of the album is composed of new material, including recent singles ‘Rectifier’ and ‘Detroit’. Following ‘City’ in the tracklisting, ‘Detroit’ continues the album’s breakneck, full-tilt pace with fuzzy guitar melodies and unrelenting drums. Its rather morose verse lyrics contrast sharply with the undeniably catchy chorus line “I don’t wanna be nowhere else except for Detroit city”. The album’s tone turns slightly darker with the deep bass growl and existential chorus of standout track ‘Who Are You?’. Musa’s vocals aren’t particularly remarkable, but his lyrics occasionally are, including the refrain “tonight I just wanna be somebody else, somebody new / tonight I just wanna be something that I can say is true”, and the echoing repeat of the song’s title line. An unexpected sax solo just before the final chorus feels somewhat out of place in the context of the song’s frenetic psych/punk/rock tone and is the first hint of overproduction on Musa’s part. One of the album’s relatively slower moments is in the chugging tempo, echoing vocals and slightly softer verse dynamic of ‘It’s So Dark’. That song’s overarching darkness theme segues quite nicely into the hazy, drunken tempo of the surprisingly sensual ‘Take Me Away’. These mid-album tracks, where Spring King step momentarily outside the confines of their garage rock comfort zone, are among the most interesting moments on the LP. Title track ‘Tell Me If You Like To’ is decidedly brash and unreasonably bratty, adamantly declaring “tell me if you like to / I wanna fight you / punch you through the ceiling / I got the feeling now” in its opening lines. ‘The Summer’, Musa’s ode to Beach Boys icon Brian Wilson, was featured as BBC Radio 1’s Track of the Day back in May. But rather than lifting the album’s mood, the song somehow comes across as a bit murky, despite a bright keyboard melody peeking through the heavy rhythm section and a full chorus of backing vocals. Final track ‘Heaven’ achieves a slightly more lofty tone, despite its muscular framework of bass and drums. Its oft-repeated chorus “heaven, heaven, heaven is where you know yourself / and you’ve opened your heart to someone else” could easily become a live singalong favourite; expect to hear it on Spring King’s October tour of the UK. In the end, Spring King seem to have gotten caught between two of their own stylistic tendencies, manic post-punk and slacker garage rock. The relentless drive and energy of the punk side, which seems to be Spring King’s stronger suit, eventually becomes bogged down in the album’s hefty instrumental arrangements and overblown vocal distortions. But while the production on ‘Tell Me If You Like To’ is perhaps a bit heavy-handed, Tarek Musa and Spring King have nonetheless put together a solid collection of generally likable songs that will no doubt continue to garner attention. 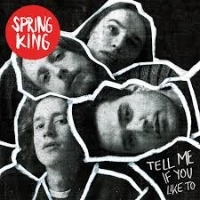 Spring King’s debut album ‘Tell Me If You Like To’ is due out tomorrow, the 10th of June, via Island Records. TGTF’s previous coverage of Spring King is back here.